Hammer Films' adaptation of Nigel Kneale's television miniseries/serial The Quatermass Xperiment, released in the summer of 1955, and the airing of his Quatermass II on the BBC soon thereafter launched an entire sub-genre of British productions emulating those popular successes. Hammer itself made X the Unknown (1956), the best of the imitation Quatermass movies, as well as the film version of Quatermass 2 (1957), one of the best science fiction films ever. At the time these lower-budgeted British movies were still frequently buttressed with a familiar American star; the Quatermass movies had Brian Donlevy while X the Unknown starred Oscar-winning character actor Dean Jagger. Forrest Tucker made no less than three such films in England not quite back-to-back: Hammer's The Abominable Snowman of the Himalayas (1957), yet another Nigel Kneale adaptation, and two Quatermass wannabes, The Trollenberg Terror (1958), better known under its American release title, The Crawling Eye; and The Strange World of Planet X, which was called Cosmic Monsters on the posters but The Cosmic Monster onscreen. 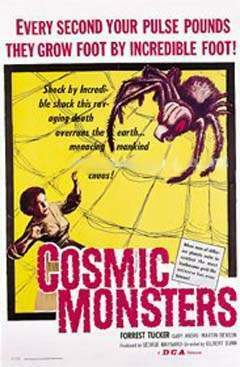 Snowman and The Crawling Eye have been on DVD for some time, and though Wade Williams' label released a VHS version in early-1998, an official DVD of The Cosmic Monster had been stubbornly elusive. However, DD Video in the U.K. released a Region 2 PAL version under the original British title, and the good news is that while the packaging claims the film is presented in 4:3 full frame, in fact the DVD is 16:9 enhanced and correctly matted to its original 1.66:1 theatrical aspect ratio. The movie itself is another matter. The Strange World of Planet X lacks both the restraint and intelligence of The Abominable Snowman and the engrossing if goofy Grand Guignol charm of The Crawling Eye, the end result being a lot closer to a British Bert I. Gordon movie than a Quatermass one. Adapted from yet another television serial, this one written by actress Rene Ray, the movie version is a notably inconsistent and dramatically unsound jumble of ideas. Dr. Laird (Alec Mango), mad as a March Hare, and American Gil Graham (Tucker) are researching magnetic fields, which their government backers hope will have military applications. (The machine changes the molecular structure of metals, rendering them as fragile as Saltines.) A third scientist is injured and replaced with Frenchwoman Michelle Dupont (Gaby Andre of Goliath and the Dragon; her voice here is painfully, obviously dubbed by someone else). Their experiments eventually punch a hole in the ionosphere allowing dangerous cosmic rays to dribble down into a spooky forest near the laboratory. To say the effects are inconsistent would be an understatement: a kindly tramp gets his face burned and becomes a psychotic killer, while insects in the forest grow to the size of Mini Coopers. Added to the mix is an enigmatic stranger (from Venus?) going by the name of Smith (Brit Martin Benson, best remembered as the American gangster crushed with his car into a dense metal cube in Goldfinger). Sloppily conceived, The Strange World of Planet X lurches along for most of its 72 minutes killing time with Quatermass-inspired intrigue until the lively if ineptly done climax, with Big Bugs making their appearance in the form of macro-photography of real insects, elementary mattes shots, a few oversized props, and terrible miniatures, none any better than the cheap gigantism of producer Bert I. Gordon's American counterparts. Signs that the film was slapped together in great haste becomes especially apparent here, as the cutting of the film is extremely haphazard with screwy jump-cuts and poor day-for-night matching worthy of Ed Wood. There are brief flashes of imagination, nightmarish images which include a child (Susan Redway) wandering the woods, alone; Michelle trapped in a giant spider's web; and, fleetingly, one poor victim whose flesh torn from his face, revealing part of his skull. (This was achieved with an unconvincing mannequin-like prop.) Anglo-Scottish Pictures, Ltd., which did superior effects for The Crawling Eye, were wise in their choice of creepy-crawly insects, especially variations and truly disgusting varieties of centipedes. Mostly though, The Strange World of Planet X is rife with sci-fi movie cliches, from the introduction of its female scientist ("A... woman? This is preposterous. This is highly skilled work!") to the boring and unlikely love triangle that results between Gil, Michelle, and a government representative (Geoffrey Chater). The picture has no momentum and characters that aren't very interesting. When even mankind's first alien visitor fails to generate any excitement you know the film is in trouble. The Strange World of Planet X is presented 16:9 enhanced with a black bar on the left side of the frame to retain the film's original 1.66:1 framing. The image is a bit soft and washed out but overall acceptable. The audio likewise is less than perfect, but okay. DD Video had been producing elaborate full-color booklets with their horror and sci-fi titles, along with commentaries and other extras, but this title is bare bones. There are no Extra Features, not even a trailer. Only '50s sci-fi completists will have the patience and forgiving nature required to slough though The Strange World of Planet X which, despite brief moments of nightmarish imagery, is very minor. Rent It.